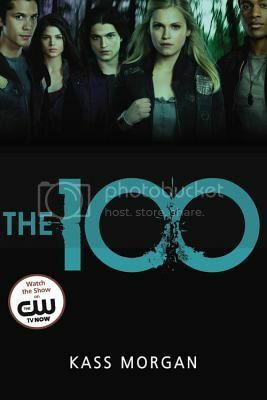 I was super excited to finally read The 100, as I have had the book on my to-read list for quite a while now. Now that I’ve read the book, I’m hooked, and I can’t wait to start on the next book in the series! Hundreds of years after Earth had been destroyed in a nuclear war, people live in space in large, city-like spaceships. But with resources decreasing and the population increasing, life on the ships will not be able to go on much longer. The only chance for survival is to see if the long abandoned planet can be habitable again, and who better to test this than 100 juvenile delinquents who are all set to die anyways. Clarke, who was Confined (imprisoned) for treason, even though it really wasn’t her that did the treason; it was her parents. Wells, who is in love with Clarke, and committed a massive act of defiance in order to follow Clarke to Earth to keep her safe. Bellamy, whose will do anything that he has to do to keep his sister safe, which he proves in the beginning of the story when he does something drastic so that he can go to Earth with his sister. And Glass, who was also supposed to go to Earth, but manages to escape back onto the ship, where things are just as bad for her when things start falling part on the ship. Each character has their own back-story that we get to read as flashbacks throughout the novel, and not everyone has a happy story. They were all really interesting characters, however, and I’m really looking forward to getting to know them more in the next book in the series. The storyline for this book was really creative and kept me hooked as I turned the pages. I read the book in one day, and I didn’t want to put it down at all. The storyline felt very realistic as well, it’s something that I can see happening in our future, and that’s always a little terrifying to me. Seeing life on the spaceship was definitely interesting as well. I have not watched the TV show based off the book, so I can’t compare the book to the show at all. But the show does look as interesting as the book, so I may check that out as well. Overall; I enjoyed this book so much more than I expected to! And now I have to start the next book in the series, Day 21, as soon as possible to see what is going to happen with these characters and this story! Okay, I'm definitely going to look for a copy of this book - you make it sound so great!